"Each month, we co-sponsor events across the country and abroad as part of our “Celebrate Childhood” campaign.We partner and work closely with a number of organizations that work to celebrate life and the “child within.”At Zooni, our commitment to giving back is ‘sewn in.’Zooni was inspired by the arrival of our own children." 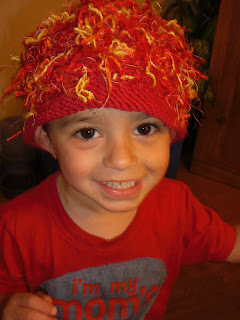 I noticed when looking for hats for my boys over the years it is hard to find something besides the basic knit Winter hat. They always have tons of cute little hats for girls and nothing to pick from for boys. That is until I was introduced to Zooniwear ! These adorable hand-knit hats are not only full of style but also fully functional to keep those little heads warm. Each of the Zooniwear desi gns are 100% unique. We received the Firecracker style which is red and bright strands in a eye-catching pattern ! Not only does the name capture his personality but the hat does also ! They are available in sizes from newborn - 5yrs. The size we received was 2-5yrs. Bryce being 2 means we will get many years of wear out of the hat ! 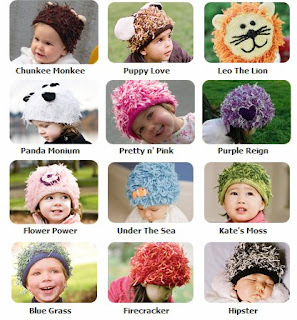 Zooniwear has 12 mop hats to choose from, you are bound to find something that matches your child’s style. Zooniwear also creates hand-knit "M'uppet Mittens" to protect those precious hands when the weather gets chilly. Check them out and order now to be ready for next Winter. Let me know which one you like.......I bet you can not pick just one ! ZooniWear is a Playdate Pick. I love the Zooni's hat. Melinda got one for review for Shae. She look like she is in the Loyal order of Water Buffalos from the Flintstones. LOL. She looks cute. They are the BEST hats!